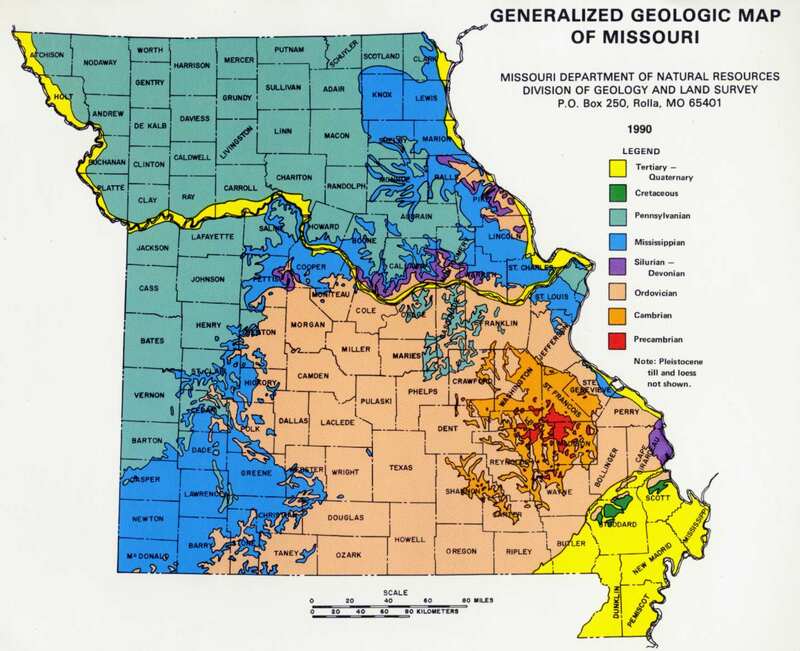 Geologic Map of Missouri, 1990, Missouri Department of Natural Resources, Division of Geology and Land Survey (now Geological Survey and Resource Assessment Division). Ordovician age rocks are well represented in Missouri. They are largely carbonates and thin shales, along with three distinctive sandstone layers: the Gunter at the base of the column, the attractive red and white Roubidoux, used as a building stone, and the St. Peter glass sand. More caves are found in Ordovician aged rocks than any other, with Cambrian and Mississippian aged rocks running a close second. Unlike the Cambrian, Ordovician rocks in Missouri show frequent breaks in deposition. These erosional surfaces indicate that the Ordovician seas were shallower and less constant than those previously. Thickness of some layers vary greatly at different locations; this also shows much environmental variation even over such a small region as Missouri. Four series, (Canadian, Whiterockian, Mohawkian and Cincinnatian) each separated by erosional unconformities exist in the Missouri Ordovician, capped with a large gap between the Ordovician and overlying Mississippian rocks. In the Ordovician, Missouri had moved slightly north of the paleoequator, but was still well within the tropical zone. The base Gunter sandstone varies over the region from tens of feet thick to barely recognizable as a sandy layer in the dolomite. No substantial break in deposition occurred between the Cambrian and the Ordovician.The Gasconade dolomite is one of the most massive (and cavernous) units in the sequence, with caves often forming in the youngest Gasconade, near its contact with the Robidoux formation--usually the aforementioned sandstone. The Gasconade contains stromatolitic chert layers, which often well-preserves gastropod fossils. Subsequent dolomites are thinly bedded, more fossiliferous, and often contain more clay, for a "muddier" or more micritic texture. These rocks of the lower Ordovician were deposited as the Sauk transgression slowly moved out, leaving the land dry after depositing the Cotter and Powell dolomites. After a period in which exposed carbonates began to erode, the Tippecanoe transgression began in the middle Ordovician. The St. Peter sandstone, a very white, friable (it crumbles in your hands), and 98% pure quartz sand is the first Tippecanoe deposit. It forms great cliffs along the eastern side of the state, and has been mined for over 100 years for glass and refractory brick. This rock layer is known as the Crystal Escarpment; excellent exposures are near the towns of Crystal City and Pacific. This "ultra-mature" beach sand marks the second inundation of the Ordovician; immediately above it is the St. Joachim dolomite, whose distinctive yellow "cotton rock" is considered by some to be a primary evaporative dolomite. In the middle Orodvician, minor uplift of the Ozark Dome (southern Missouri) occurred. Orodvician shales are supposed to have been derived from as far away as modern Pennsylvania. Another layer higher in the column worth noting is the Kimmswick Formation. This crystalline limestone contains a 6 inch to one foot thick bentonite band. Bentonite is a swelling clay derived from decomposed volcanic ash. This bentonite layer can be traced through the Midwest, and is thought to be related to the beginning of the Taconic Orogeny--the mountain building episode on the eastern North American coast caused by Africa grinding into the continent, and raising the Appalachian Mountains for the first time about 450 million years ago. The Kimmswick is also noted as fine building stone. The late Ordovician in Missouri is represented by a few shales and limestones. The shales are ones which probably formed in shallow environments as the great Ordovician sea retreated, due to the mountain building to the east, and climatic cooling of the globe, which locked seawater up in Gondwana glaciation at the South Pole. Ordovician fossils in Missouri are similar to those of the Cambrian, with brachiopods and gastropods dominating, corals becoming more diverse and common, bryozoans and graptolites appearing, trilobites declining and a few interesting additions, such as receptaculids, a green algae colony which resembles nothing so much as the seed head of a European sunflower. Even though the first land plants appeared in the Ordovician, most, if not all of Missouri was underwater at that time, so we have little remains from them.